Ryan Speier pitched for the Rockies from 2005 to 2009. In 90 games he went 7-3 with a 3.99 ERA. Now the owner of Speier Pitching Lessons in Tulsa, OK, he kindly answered my questions about baseball cards. "I began collecting baseball cards in 1986, and the 1986 Topps series was the first series of cards that I collected. I can remember going to 7-Eleven after a Little League game and my dad offering me my pick of one treat from the convenience store. I remember being torn between a Slurpee or a pack of baseball cards. Initially, I was more interested in the gum than the cards, but soon grew attached to the cards. Before long, I had the entire set from that year. I continued to collect baseball cards through the mid-90s and still have all my cards tucked away in storage. I plan to pass them on to my son when he's old enough to have an appreciation for them. Ever since Upper Deck cards came about, they've been my favorite brand. My favorite card of myself is from the 2008 Upper Deck series because the picture was taken from a 2007 World Series game. My favorite two cards are my Cal Ripken Jr. and Tony Gwynn rookie cards. These two gentlemen emulated what I believe a ballplayer should be while they're in uniform. " Thanks! Here is a card of him from my collection, from 2005 Bowman Chrome. Outfielder Cameron Satterwhite played three seasons of professional baseball, including a year in the Reds organization where he hit .253 with 8 HR and 44 RBI in 80 games. Now Assistant Director of the Reds Urban Youth Academy, he kindly answered my questions about baseball cards. "A quick story about my cards, I actually didn’t know that I had a card until I was playing independent ball after being released. I was in St. Louis and had just gotten off the bus when a fan ran up to me and asked if I would mind signing. I said sure, not a problem. He handed me a card and I saw myself on it and was in complete disbelief! It was something I had always dreamed of when I was a kid and was pretty cool to see. The only downside of the card was that Topps came to take the picture during my off-day and instead of playing I was coaching 1st base. I am not really a baseball card guy anymore, but as a kid I always loved to see the chrome or holographic Ken Griffey Jr. cards. Being that he was and still is my favorite player of all time, I loved seeing the shine and effect of the holographic Ken Griffey Jr cards. Unfortunately I do not collect baseball cards. I know people who do and they tend to give me different versions of my personal cards but that was just something that I never got in to. Maybe one day I will have a better love of cards but for now, I am just a baseball fan." John Graves pitched in the Rangers organization in 1989 and 1990, going 7-8 with 17 saves and a 2.52 ERA. Check out his recent three-part interview with The Greatest 21 Days. Now an embryologist at OU Physicians Reproductive Medicine in Oklahoma City, he kindly answered my questions about baseball cards. Do you have a favorite card of yourself or of another player? My favorite cards are all of the ones I used to collect when I was a kid… early 70s to early 80s. I have one card of Andrew Brackman, from 2012 Topps Heritage. 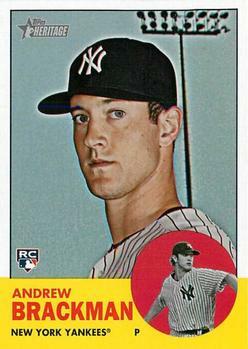 Playing career: Andrew Brackman, the Yankees’ first round pick in 2007, was a major bust. In 124 minor league games he went 17-35 with a 5.38 ERA. He did pitch in three major league games for the Yankees in 2011. My memories: That end-of-2011 call-up seemed to be a pity call-up more than anything else – he had been 3-6 with a 6.00 ERA at Scranton that year. If I remember correctly Dellin Betances got a similar “pity call-up” – he was another highly-rated prospect having trouble putting it all together. I didn’t think I would see either as a Yankee again – I was right about Brackman, but thankfully wrong about Betances. Where he is now: Anyone know where Andrew Brackman is now? Google Autocomplete results: He is tenth when you type Andrew Br, behind Andrew Brischler, an artist. There do not appear to be any other prominent Andrew Brackmans. Coming up next: The next profile will be Jackie Bradley Jr. 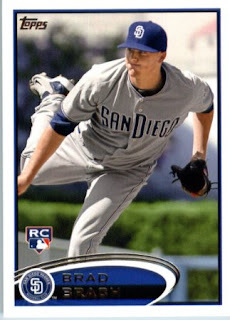 I have one card of Brad Brach, from 2012 Topps. Playing career: Brad Brach has pitched in over 200 games since his debut with the Padres in 2011. Traded to the Orioles after the 2013 season, he had gone 15-10 with 1 save and a 3.25 ERA through 2015. Where he is now: In nine games this season he is 2-0 with a 0.79 ERA. He last pitched on Saturday, throwing 2.1 scoreless innings in a win at Kansas City. Google Autocomplete results: He is first when you type Brad Br, ahead of Brad Browning, a relationship coach. There do not appear to be any other prominent Brad Brachs. Coming up next: The next profile will be Andrew Brackman. I have one card of Kyle Boyer, from 2003 Upper Deck Prospect Premiers. 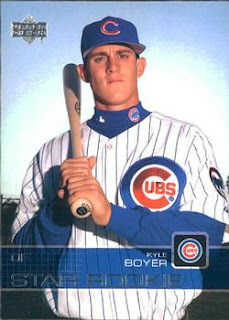 Playing career: Outfielder Kyle Boyer played in the Cubs organization from 2003 to 2005. In 166 games he hit .264 with 20 HR and 80 RBI. Where he is now: Anyone know where Kyle Boyer is now? Google Autocomplete results: He is third when you type Kyle Boy, between Kyle Boyd Hudl, referring to a high school football player in New Jersey, and Kyle Boyle, a management consultant. The first entry when you google Kyle Boyer is not this one but an infielder who played in the Cardinals organization from 2002 to 2004. Coming up next: The next profile will be Brad Brach. I have one card of Chad Boyd, from 2007 Bowman Chrome Prospects. 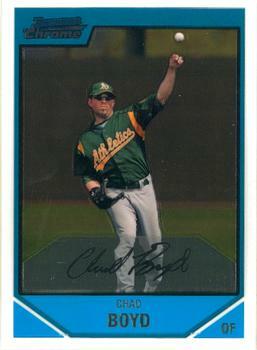 Playing career: Outfielder Chad Boyd played in the A’s organization from 2004 to 2007. In 262 games he hit .287 with 12 HR and 127 RBI. Where he is now: Anyone know where Chad Boyd is now? Google Autocomplete results: He is second when you type Chad Boy, between Chad Boyd Jersey City, referring to a man charged with attempted murder last summer, and Chad Boyle MKTO, referring to a songwriter. The first entry when you google Chad Boyd is not the baseball player but a defensive back at Louisiana Tech. Coming up next: The next profile will be Kyle Boyer. 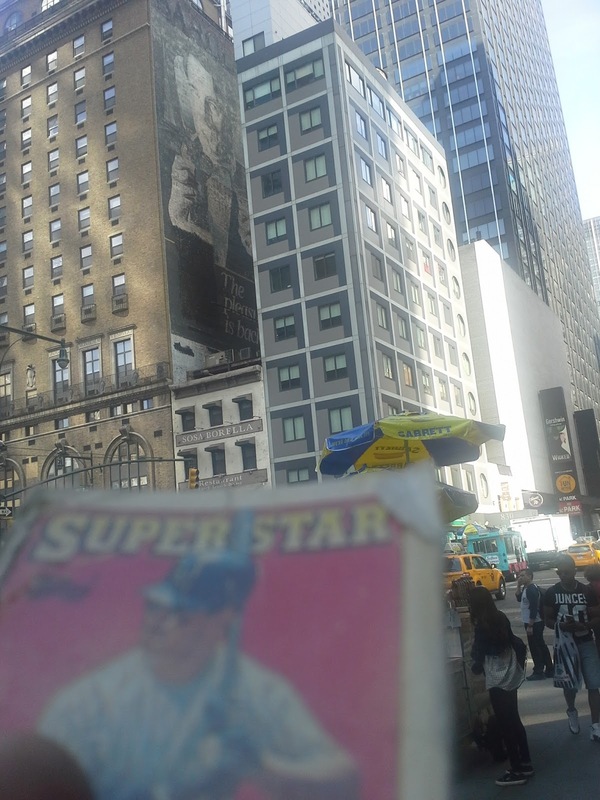 In 1980 Brown & Williamson introduced what it touted to be a revolutionary low-tar cigarette, the Barclay, and had a major ad campaign that included a huge painted billboard on Eighth Avenue and 50th Street. The Barclay cigarette caused immediate controversy as it turned out the low-tar claims were because the design of the cigarette beat the FDA's tar test, rather than actually being low-tar. Sales quickly plummeted and by the end of the 1980s the cigarette had disappeared from the market. In 1985, the building on the corner was built, blocking the sign and so ensuring that no one else would bother to put a new one up, so the Barclay sign may remain an out-of-date curiosity for years to come. I have one card of Brad Bouras, from 2002 Topps Traded. 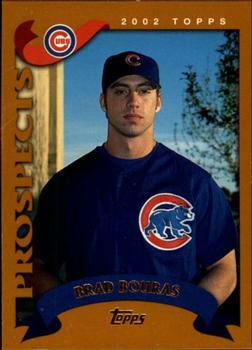 Playing career: First baseman Brad Bouras played in the Cubs organization from 2001 to 2003. In 251 games he hit .288 with 27 HR and 157 RBI. Where he is now: General Manager of Team Elite Baseball in Georgia. Google Autocomplete results: He is seventh when you type Brad Bour, between Brad Bourland, former Chief Investment Officer at Jadwa, and Brad Bourg, an insurance agent in Louisiana. There do not appear to be any other prominent Brad Bourases. Coming up next: The next profile will be Chad Boyd. My guy didn't have a box but he did have a little bag for me. There were about 60 baseball and football cards that were all chrome and refractor rookies. Still a pretty good deal for three bucks. Most of the baseball ones were Bowmans. A few were dupes like this Ryan Khoury - anyone collect these let me know. He also "threw in" a couple of lightly damaged hall-of-famer cards. I don't care about condition myself so I'm happy to trade better versions of these cards to someone who can use them, and put these in their place in my collection. Finally, there was one surprise that was really unexpected and I was very happy to get - this autographed Dan Pasqua rookie card. Exciting to get an on-card autograph of a Yankee, and even better, one that I have interviewed for this blog. I have one card of Jim Boudreau, from 1984 TCMA. Playing career: The son of Hall-of-Famer Lou Boudreau, Jim Boudreau pitched for five seasons in the Cubs and Orioles organizations. In 150 games he went 30-26 with 8 saves and a 3.57 ERA. Where he is now: Manager of Staffing at Magid Glove & Safety and a baseball coach at Bo Jackson’s Elite Sports, both in Chicago. My memories: He shared his thoughts on baseball cards with this blog earlier this year. Google Autocomplete results: He is first when you type Jim Boud, ahead of Jim Boudreaux, a guard for the Patriots in the 1960s. The first entry when you google Jim Boudreau is not the ballplayer but a Financial Advisor at Edward Jones. Coming up next: The next profile will be Brad Bouras. 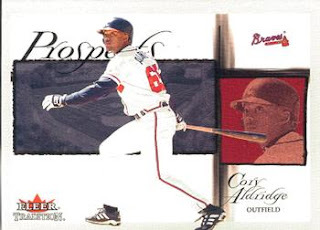 I have one card of Cory Aldridge, from 2002 Fleer Tradition. Playing career: Outfielder Cory Aldridge played eighteen seasons of professional baseball. He made the major leagues for eight games with the 2001 Braves and five games with the 2010 Angels, getting one hit, a triple, in 18 at bats. Interesting facts: His father Jerry Aldridge, a running back, played for the San Francisco 49ers in 1980. Where he is now: Anyone know where Cory Aldridge is now? Google Autocomplete results: He is sixth when you type Cory Al, between Corey Alexander, a former pro basketball player, and Cory Allen Michael Monteith, an actor. There do not appear to be any other prominent Cory Aldridges. Coming up next: The next profile will be Jim Boudreau. 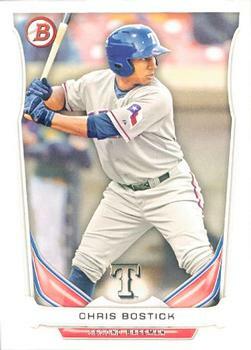 I have one card of Chris Bostick, from 2014 Bowman Prospects. Playing career: Chris Bostick was the 44th-round pick of the A’s in 2011. After three years of A ball he was traded to the Rangers. Where he is now: He was traded for the second time in two years before the 2015 season, this time to the Nationals. He split the season between Class-A Potomac and Class-AA Harrisburg, hitting .258 with 12 HR and 58 RBI. This year he is back at Harrisburg, and is hitting .242 with 0 HR and 2 RBI over his first nine games. Google Autocomplete results: He is the first entry when you type Chris Bost, ahead of Chris Bostock a musician. Another prominent Chris Bostick is a car dealer who has gotten into legal trouble. Went to Yankee Stadium today and saw a fun, exciting game with the Yankees squeaking by 4-3, with the winning run coming when Brett Gardner scored on a wild pitch. Masahiro pitched like a hero, gaining the win with seven strong innings, and Dellin Betances and Andrew Miller each struck out the side in their single innings. Right after I took this photo Tanaka got out of trouble by getting Robby Cano to bounce into a 1-6-3 double play. I picked up another street box. This is the second of what will probably be three, possibly four. Pretty similar to last time - lots of junk wax (anyone collecting 1986 Topps? 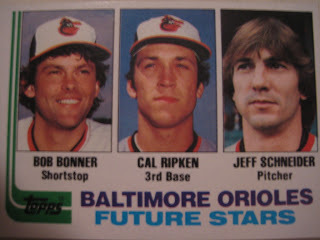 1987 Topps? 1992 Donruss? ), some other base sets that I've already completed (anyone for 2001 Topps? 2008 Topps? ), but enough recent randoms to make me happy. In a way it is extra-special to get card needs from the junk wax era; it's pretty rare for me to pick up cards from 1987-1992 that I didn't already have. I got a couple of Collect-A-Books which were new to me. Inside the card-sized book are a couple of pages of stats and facts (did you know Kevin Mitchell's nickname was "Boogie Bear"? ), and on the back is a neat caricature. An even older card need. Lots of fun to get an early-1980s food-issue oddball. Once again the recent cards were mostly, 2001 and 2002 Fleer Tradition, though there were a few randoms from other 2000s-era sets as well. Jason Quarles pitched in the Pirates organization in 2004 and 2005. In 42 games he went 0-7 with a 3.34 ERA. Now Assistant Strength & Conditioning Coach at Indiana University - Purdue, he kindly answered my questions about baseball cards. "I don’t really have too many stories only really that it really showed that my dream was coming true. I have a few cards that were my favorite. I actually don’t own one card of myself haha. 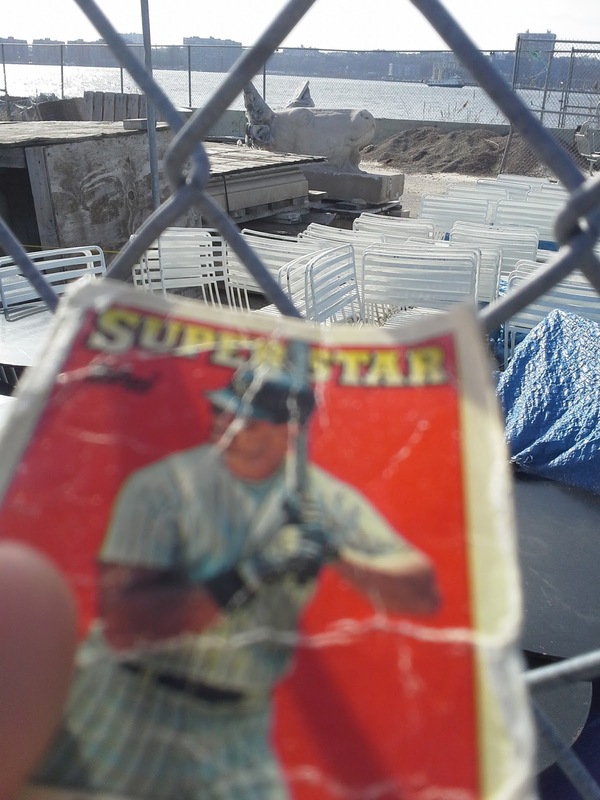 When I was younger my family got me the entire series of Topps and other cards for holidays." I have one card of Buddy Boshers, from 2014 Topps. 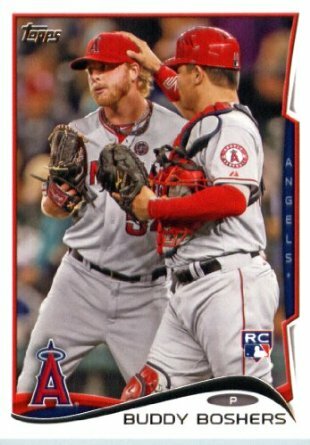 Playing career: Buddy Boshers pitched in 25 games for the Angels in 2013, going 0-0 with a 4.70 ERA. Let go by the Angels after posting a 6.23 ERA at AAA in 2014, he signed on with the independent Somerset Patriots, where he excelled in 2015, going 3-1 with a 1.00 ERA in 52 games. Where he is now: The Twins were impressed with his independent-league performance and signed him to a minor league contract for 2016. In two games at AAA Rochester he has allowed one earned run in 2.2 innings. Google Autocomplete results: He is second when you type Buddy Bos, between Buddy Boss, a collection of website themes, and referring to a TV baker. There do not appear to be any other prominent Buddy Bosherses. Coming up next: The next profile will be Chris Bostick. I have four cards of Julio Borbon. This one is from 2011 Topps. 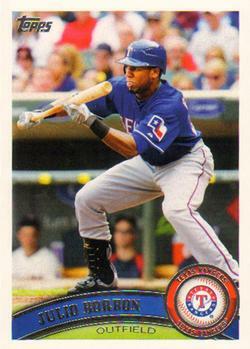 Playing career: Outfielder Julio Borbon played for the Rangers and Cubs from 2009 to 2013. In 288 games he hit .272 with 8 HR and 76 RBI. Where he is now: He is in his third season in the Orioles organization. In five games at AA Bowie he is hitting .238 with 1 HR and 3 RBI. Google Autocomplete results: He is eighth when you type Julio B, between Julio Bicycles, a store in Chappaqua, NY, and Julio Bashmore Essential Mix, referring to a DJ. There do not appear to be any other prominent Julio Borbons. Coming up next: The next profile will be Buddy Boshers. I have one card of James Boone, from 2005 Bowman Draft. Playing career: Outfielder James Boone played in the Pirates organization from 2005 to 2009. In 312 games he hit .246 with 29 HR and 146 RBI. Where he is now: Owns Pro B Farms in Clinton, OK.
Google Autocomplete results: He is second when you type James Boo, between James Booker, a musician, and James Booth, and actor. There are no mentions of the ballplayer on the first page of google results; most refer to the eldest child of Daniel Boone. Coming up next: The next profile will be Julio Borbon. 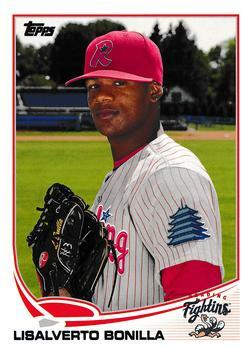 I have one card of Lisalverto Bonilla, from 2013 Topps Pro Debut. Playing career: Lisalverto Bonilla made his major league debut with the Rangers in 2014 and was excellent, going 3-0 with a 3.05 ERA in five games (three starts). Where he is now: He missed the entire 2015 season due to injury, and was claimed off of waivers by the Dodgers. He is at AAA Oklahoma City and is 0-0 with 1 save and a 4.50 ERA in two games. Google Autocomplete results: He is fifth when you type Lisal, between Lisa Lisa, a singer, and Lisalyn Jacobs, Vice President of Government Relations for Legal Momentum. There do not appear to be any other prominent Lisalverto Bonillas. Coming up next: The next profile will be James Boone. 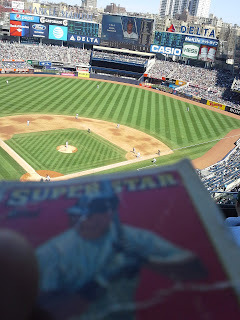 The weather is gotten warmer and the trading card street vendor on 37th and Broadway is back with more $3 boxes for me. He says there should be about three or four this time based on collections he's bought over the last few months. Like last time they are about 1,000 cards each, predominantly baseball with some other sports as well. This time there are going to be a lot more 80s and early 90s cards, which I generally don't need, but still enough stuff from the past 20 years to be worth it for me. Like last year, let me know if you want me to set aside any cards I get for trades. Not all the dupes are junk wax; in this box the traders include a bunch of early-80s Topps and Fleer, a few 1987 Fleer Baseball's Best, including Roger Clemens, and a whole lot of pack-fresh 1986 Topps, a set that mint cards are hard to come by due to the black borders. Here are some highlights from the cards in the box that I did need for my collection. Of the 100 or so cards that I needed, probably 90 were from 2001 and 2002 Fleer Tradition. Got a fair amount of dupes of these as well. I don't have any 2016's yet, so I haven't personally witnessed the supposedly awful photoshop/filtering going on. Still, this 2015 is pretty bad - in person it almost looks like 1980s style airbrushing. This was probably the best card in the box. Slipped through because it had tape on all four sides - you might be able to tell from the photo. Fortunately condition does not matter to me. Outfielder Steve Phillips played in the Yankees organization from 1991 to 1995. In 325 games he hit .265 with 32 HR and 197 RBI. Now the owner of POWER Baseball in Sioux Falls, SD, he kindly answered my questions about baseball cards. "I have never been a card collector. Now that I am running a youth baseball program, it is kind of cool when some of the parents or kids find my old cards." 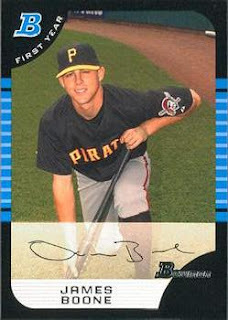 I have one card of Kyle Bone, from 2004 Pepsi Salem-Keizer Volcanoes. Playing career: Catcher Kyle Bone played in the Giants organization in 2004 and 2005. In 33 games he hit .183 with 0 HR and 13 RBI. Where he is now: Assistant Coach at Miami Country Day School. Google Autocomplete results: He is tenth when you type Kyle Bon, behind Kyle Bonis, a minor league hockey player. Another prominent Kyle Bone is a high school football player in Virginia. Coming up next: The next profile will be Lisalverto Bonilla. I have one card of Ryan Bolden, from 2010 Bowman Draft Picks & Prospects Chrome. 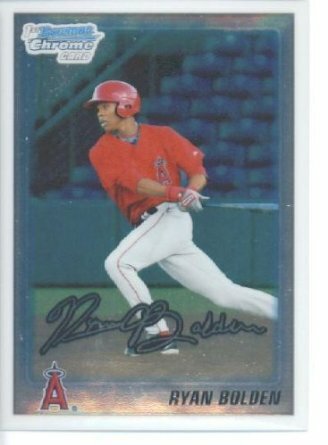 Playing career: Outfielder Ryan Bolden was the Angels’ first round draft pick in 2010, but struggled mightily at the professional level, hitting just .164 with 3 HR and 36 RBI in 112 games before retiring in 2013. Post-playing career: In December of 2014 Bolden was one of several adults who got involved in a dispute among children over candy. One of the other adults fatally shot Bolden in the chest. He was 23 years old. Google Autocomplete results: He is first when you type Ryan Bol, ahead of Ryan Bollman, an actor. There do not appear to be any other prominent Ryan Boldens. Coming up next: The next profile will be Kyle Bone. 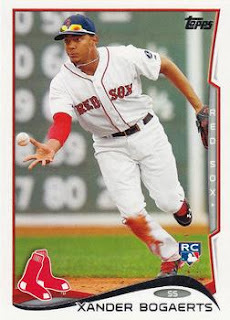 I have four cards of Xander Bogaerts. This one is from 2014 Topps. Playing career: Red Sox shortstop Xander Bogaerts came up with a lot of hype but struggled in his rookie year in 2014, hitting .240 with 12 HR and 46 RBI. Where he is now: Bogaerts cut down on his power and improved on his overall game in 2015, hitting .320 with 7 HR and 81 RBI. My memories: He was one of several young Red Sox who pounded on the Yankees in the second half. Google Autocomplete results: He is sixth when you type Xan, between Xanga, a social media site, and Xanax Bars, a drug. There do not appear to be any other prominent Xander Bogaertses. Coming up next: The next profile will be Ryan Bolden. When I posted the remnants of the West Side Highway sitting in a park along the Hudson River in midtown Manhattan, I mentioned that they were not the only historical oddity located in the park. Near those wing friezes were several large stone cow heads. Most were in boxes but this one was completely out in the open. The heads, each weighing over a ton, once adorned the facade of the New York Butchers' Dressed Meat Company Building, built in the 1900s and torn down in the early 1990s. I have one card of Billy Blythe, from 1994 Stadium Club Draft. Playing career: Billy Blythe was the Braves’ eighth-round draft pick in 1994 and was a major bust. In 83 games, almost all at Class-A Macon, he went 7-25 with a 6.37 ERA. Where is now: Works at Wal-Mart in Savannah, GA.
Google Autocomplete results: He is first when you type Billy Bly, ahead of Billy Blythe Opera, an opera about former president Bill Clinton (born William Jefferson Blythe). Another prominent Billy Blythe served in the Air Force during the Vietnam War. Coming up next: The next profile will be Xander Bogaerts. Of course I always predict the Yankees. Still, they technically were a playoff team last year and can still be quite good when healthy. No more David Price, and the offensive run they went on in last year's second half isn't really sustainable. Still an extremely talented team. I don't like sleeping on the Red Sox - there is still a lot of dangerous talent on this team. And signing Price can certainly cause a big shift in power in the AL East. They had a pretty good team for a couple of years there, but weren't able to make much of it, and it looks like the window is starting to close for them. With Joe Maddon gone it looks like they are sliding back into their "Devil Rays" ways. They are a really solid team with no overwhelming strengths but are above average in every area. I keep picking them highly each year, based on their manager and several talented young players. Hopefully one year I'll get it right. Easy to forget that the Twins were in the Wild Card hunt into the last week of the season. They seem more like a team that will regress than build on that showing, but they're not pushovers anymore. They need to find another 14-year-old boy to replace the veteran leadership lost when Adam LaRoche's son was banned from the clubhouse and the whole team revolted. Not much left around Miguel Cabrera. They're no laughingstock anymore - they are a young, dangerous team as the Yankees found out in October. They won the division last year, I'm not really sure how. A full season of Hamels and Darvish could actually make this pretty good team really great. Easy to forget, but two years ago they had the best regular season record in the major leagues. Oakland always does OK with their low-budget teams, but it seems to have gotten harder for them to outsmart the competition over the last few years. Robinson Cano will bounce back, and they have two very good starting pitchers, but the rest of this team is unproven at best. There is a ton of talent on this team, and Dusty Baker should be a lot better at getting the most out of them than Matt Williams was. Pinning all of your hopes on three young starting pitchers is a dangerous thing. If even one of them is hurt for a long stretch, this is a very ordinary team. Neither the offense nor the bullpen is particularly impressive. Still, based on the last couple of years, it seems certain that whatever team they trade Cespedes to mid-season will make the playoffs. Like the Mariners, they have a couple of really good players and a lot of unproven commodities. Fortunately for Miami, they play in a much weaker division. Philadelphia seems like they would be a candidate for a pretty short rebuild, and already have some solid pieces in place. A Wild Card run seems a bit improbable for 2016 but probably quite doable for 2017. On the other hand the Braves appear to be in complete tear-down mode and would seem to be several years away from contention. With all the hoopla over the Cubs this off-season, everyone forgets that it was St. Louis who actually won 100 games last year. All the Cardinals do, at least in the regular season, is win consistently, and should be picked to finish first until they prove otherwise. Everyone is jumping on their bandwagon this year, but do utilityman Ben Zobrist and perennial-disappointment Jason Heyward really make this a much better team than the one that was thoroughly dominated by the Mets last year? Very similar to the Mets - how well they do depends almost entirely on their pitching staff staying healthy and meeting their high expectations. Last year the Brewers finished 32 games out. Hard to rate a team like that higher than fourth place. Bad as Milwaukee was last year, Cincinnati's record was actually four games worse. In 2014 I wrote " It is an even-numbered year, isn't it? Time for another surprise World Series run." Seems silly not to pick them to win it all in 2016. I guess this year we'll see if Don Mattingly was the reason this team couldn't get over the hump. My guess is that a lot of their players are not quite as good as their reputations. Maybe their big acquisitions from last year just needed a season to jell. That's kind of what happened with the Blue Jays. I could see San Diego being very aggressive at the trading deadline in a similar way if they are in the hunt in July. Signing Zack Greinke is nice but it doesn't turn a 79-83 team into a legit contender by itself. It's been a long time since the Rockies made even a blip on the national baseball consciousness. 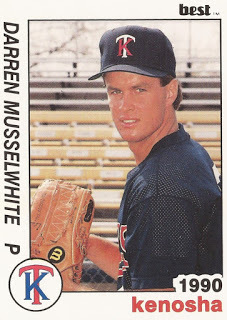 Darren Musselwhite pitched in the Giants and Twins organizations from 1989 to 1991. In 100 games he went 17-18 with six saves and a 3.93 ERA. Now an insurance agent and the mayor of Southaven, MS, he kindly answered my questions about baseball cards. "My favorite card of myself is probably my first Kenosha card. I did collect baseball cards as a kid and still have the collection, but no longer collect. My favorite cards are of Nolan Ryan and Tom Seaver as they were my favorites as a kid." 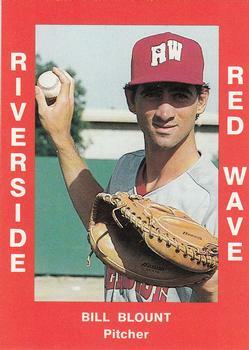 I have one card of Bill Blount, from 1988 Riverside Red Wave. Playing career: Bill Blount pitched in the Padres organization from 1985 to 1988. In 143 games he went 17-18 with 32 saves and a 3.69 ERA. Where he is now: A detective in the LAPD’s Hollenbeck station. Google Autocomplete results: He is fifth when you type Bill Blo, between Bill Bloom, EVP, Operations & Technology at The Hartford, and Bill Blodgett, Founder & President of Majesty Outdoors. There are no entries for the ballplayer on the first page of google results; most refer to an Alabama politician convicted of bribery charges. Coming up next: The next profile will be Billy Blythe.